This brightly colored low bowl was made by using hand pulled cane with an optic mold, which is a three-stage time consuming process. First Dirwood had to hand pull the canes used to make this vase, then he had to fuse them together. 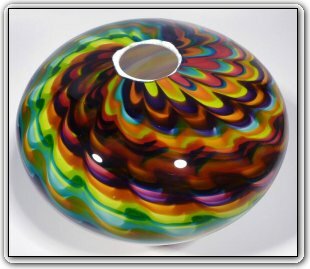 After fusing the canes together he then used the optic mold to create the textured effect, and finally he was able to create this stunning brightly colored vase. Make sure to zoom in and see how the scallops interact with the canes, adding color ripples and texture throughout.